Vote for your favourite Merton Green Flag park! A record number of Merton parks have been awarded prestigious Green Flags and throughout September residents can take part in a national vote for their favourite. In July, Abbey Recreation Ground gained its very first Green Flag award, whilst South Park Gardens, John Innes Park, Dundonald Recreation Ground, Sir Joseph Hood Memorial Playing Field, Colliers Wood Recreation Ground all retained their status as being amongst the country’s finest parks. Green Flag Awards recognise and reward the best parks in the country. New award winner Abbey Recreation Ground stood out to the judges for the impressive commitment and involvement of the community in its development and management. Pictured at Abbey Recreation Ground: Patrick Phillips from Idverde, Cabinet member for community and culture Councillor Nick Draper, Doug Napier from Merton Council, Wilmore End Residents’ Association, Jim Congrave and Keith Hunter with Councillors Eleanor Stringer and Nigel Benbow. Following on from the summer awards, the Green Flag scheme is asking residents to have their say and decide which of this year’s winners should receive the People’s Choice Awards for being the UK’s and the world’s favourite. To vote for the People’s Choice Award, find your favourite Merton park on the Green Flag winners map, open the park description and click the voting button on the right. When you have voted why not encourage others to get involved too through social media using #PeopleChoice. Voting closes on 30 September, with the top 10 sites in the UK and top ten internationally being announced on 16 October. 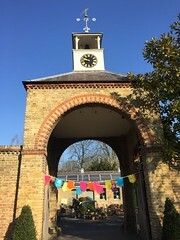 Councillor Nick Draper, Merton’s cabinet member for community and culture said: “This year we picked up six Green Flag awards, compared to five in 2017. These awards are testament to the hard work of everyone who looks after them, including the council’s parks and open spaces contractor, idverde. We are immensely proud of our Green Flag parks, which continue to be hugely popular and reinforce why Merton is a great place to live, work and visit. I would encourage everyone to vote in the People’s Choice Awards to show the rest of the country just how great our parks are”. Idverde is the council’s parks and green spaces contractor.